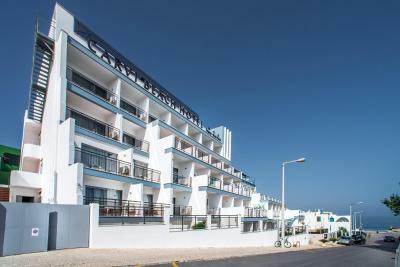 Lock in a great price for Carvi Beach Hotel – rated 8.4 by recent guests! 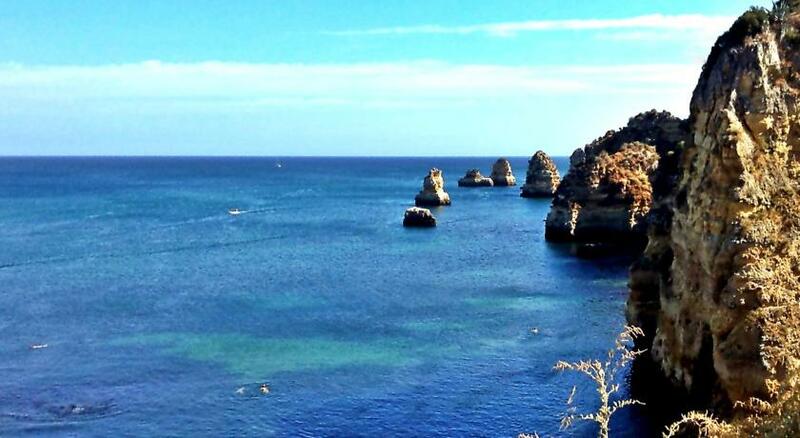 At the most beautiful beach Dona Ana .!!!! Super clean hotel and great staff. Restaurant was A+++++. Walk ways around and on cliffs were spectacular. The town was charming, All in all a great stay.!!!! The staff is amazing. They are accommodating, kind, and helpful! The property is beautiful and well kept. 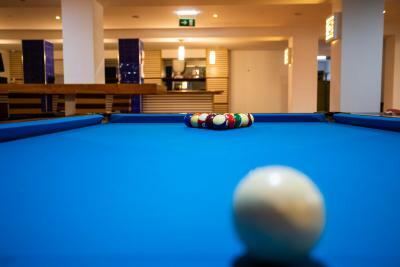 I enjoyed the smaller atmosphere - there are only a handful of rooms which contributes to the personal atmosphere and experience. 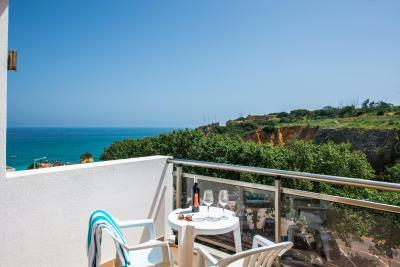 Perfect location with ocean views, but also walking distance into town. Very comfortable bed. 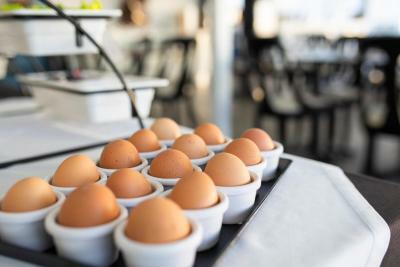 Great breakfast buffet! The staff was nice, check in was easy. The room was clean and the terrace was nice and big. Breakfast was consistent and filling. If you have a car, parking is ample and easy. 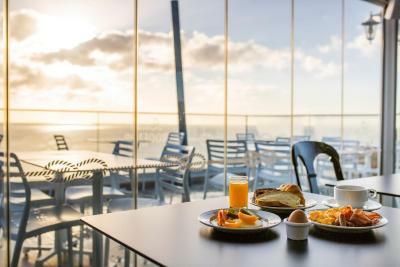 Good breakfast served on the rooftop. 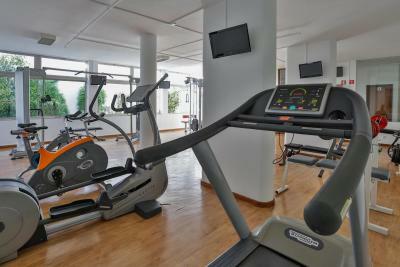 Modern hotel with well-designed rooms, properly-located electrical outlets, decent WiFi in room and around the hotel. Comfortable beds. Outstanding dinners esp spaghetti with scallops and shrimp..The breakfast was good too staff excellent. finally got my coffee was worth waiting for . The view was just amazing. 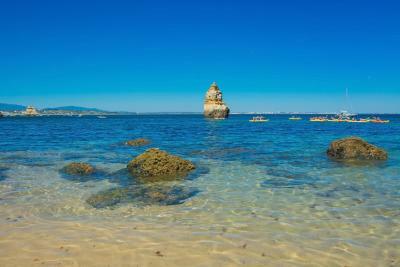 Possible to have a walk directly from the hotel or swim. Good location if you have a car. Public parking right outside. Good restaurant on site. 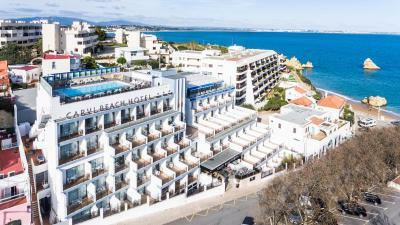 Carvi Beach Hotel This rating is a reflection of how the property compares to the industry standard when it comes to price, facilities and services available. It's based on a self-evaluation by the property. Use this rating to help choose your stay! 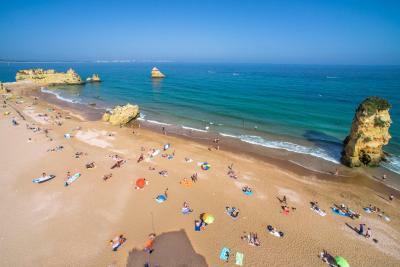 One of our top picks in Lagos.Overlooking the Atlantic Ocean, Carvi Beach Hotel is located directly on Dona Ana beach in Lagos and offers rooms with a balcony. 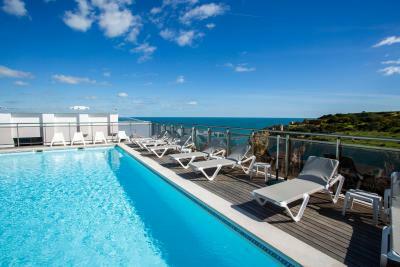 It features a rooftop swimming pool. 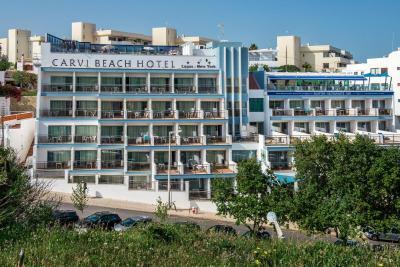 Carvi Beach Hotel’s guest rooms have a contemporary décor and include blackout curtains, a mini fridge, a safety deposit box and a private bathroom. 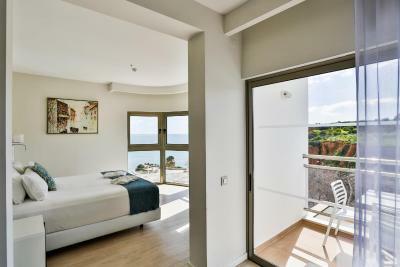 Many of the rooms provide breathtaking views of the ocean. 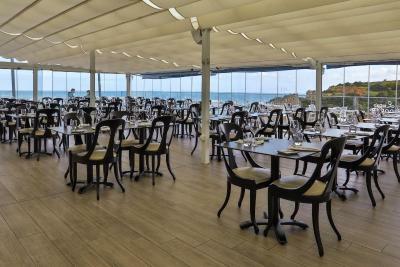 On the rooftop terrace guests will find a bar and restaurants where they can enjoy a variety of meals or refreshing beverages overlooking the sea. 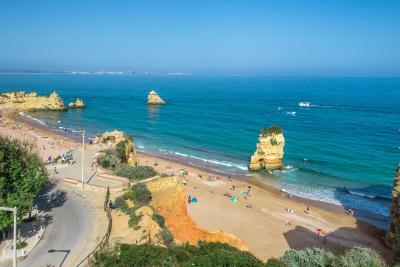 Alternatively, the historic center of Lagos is 1.1 mi away and offers a range of bars and restaurants. 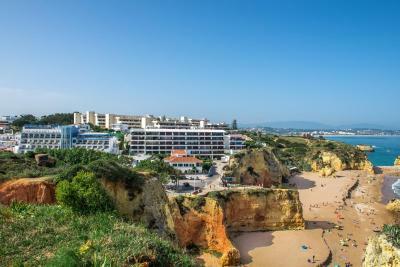 After a swim in the pool, guests of the Carvi Beach can rent a bicycle at the 24-hour reception. Free WiFi access is available throughout. 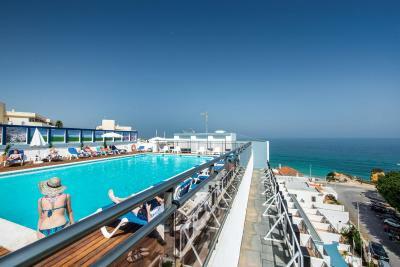 Carvi Beach Hotel is located a 10-minute drive from the Lagos Train Station and the Boavista Golf Course. 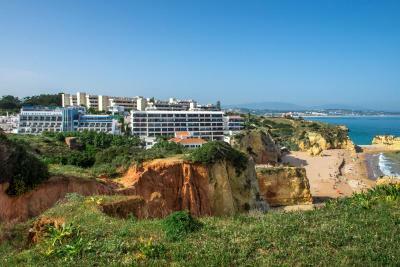 Albufeira is a 40-minute drive away. 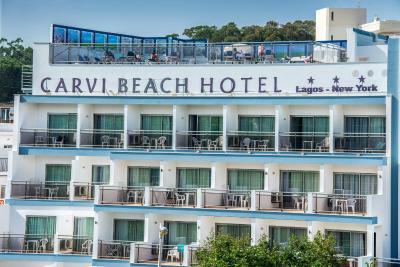 When would you like to stay at Carvi Beach Hotel? Renovated room with a satellite TV and a balcony. The private bathroom features a shower. This room has a furnished balcony and offers side views of the Atlantic Ocean. It contains a private bathroom and a satellite TV. Suite featuring a private bathroom, safe, satellite TV and a balcony. This room includes a satellite TV and a balcony. The private bathroom features a shower. 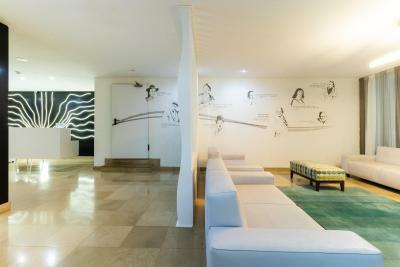 The 3rd and 4th guests are accommodated in extra beds, included in the room rate. 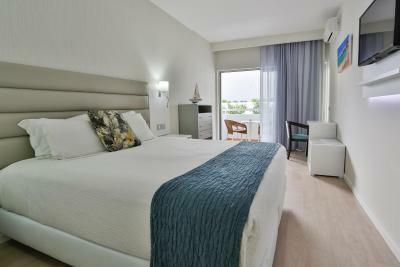 This double/twin room features a balcony, satellite TV and air conditioning. - Open bar until 2:00. 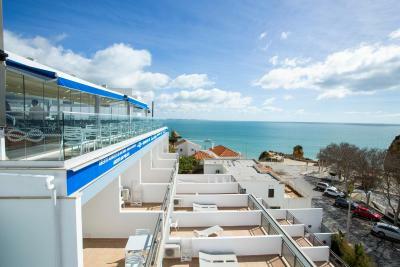 House Rules Carvi Beach Hotel takes special requests – add in the next step! Carvi Beach Hotel accepts these cards and reserves the right to temporarily hold an amount prior to arrival. Please note that public parking spots near the hotel are limited and cannot be guaranteed. The location is a bit far from station. But it is right on the beach which makes up for the distance from the station. Breakfast was really good. Staff is very polite and helpful. 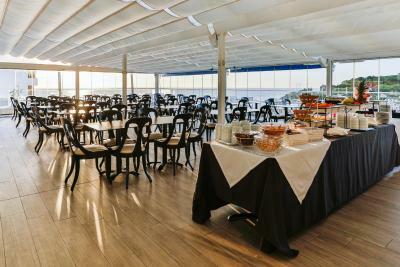 We had a spectacular time at Carvi Beach Hotel! 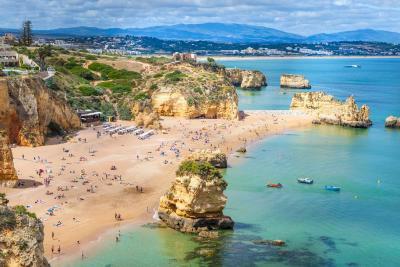 The location was perfect, right across the road from one of the most beautiful beaches, and a short walk both to town and the other incredible beaches in Lagos. 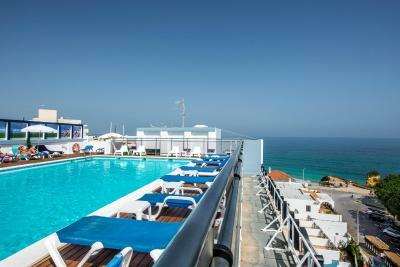 The rooftop pool offered stunning views over the ocean, as did the rooftop restaurant. 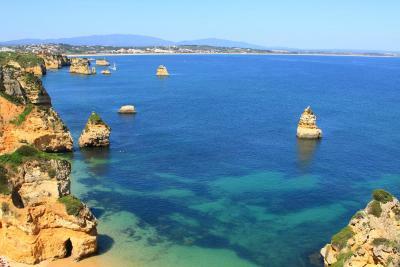 Would love to stay here again! The hotel is very dated and plain, really in need of a facelift. We were put in a room with two twin bed made separately and pushed together, not what a married couple is looking for. The restaurant breakfast & lunch left me wanting more. It was a great location! Only a short walk/drive to city Centre. Luca’s Rooftop was great for dinner. The pool was great. 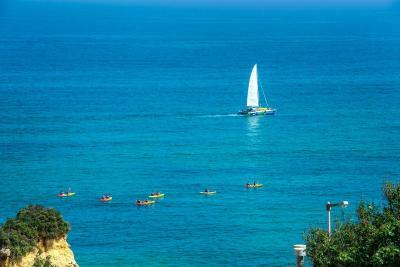 The view from the hotel is excellent and so are the beaches just a minute’s walk away. This is the place you should pick if you’re planning to park yourself at the beach mostly. It’s further away from city centre but it’s not a problem getting a cab which gets you there in 5 minutes. Walking over will be about 15-20 minutes. There was nothing i didnt like. 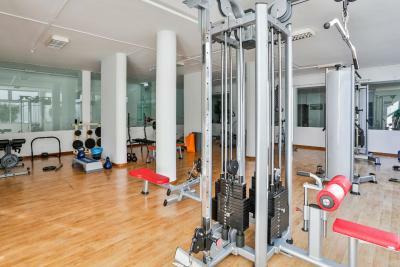 The gym could use more equipment such as free weights. Staff friendly, excellent food. Clean and comfortable. At this price not much ! Sat out in the sunshine looking at out the sea eating breakfast in early April was a joy. Spotlessly clean hotel with lovely staff from the chambermaids ( do they still call them that ? ) to the reception team and management. 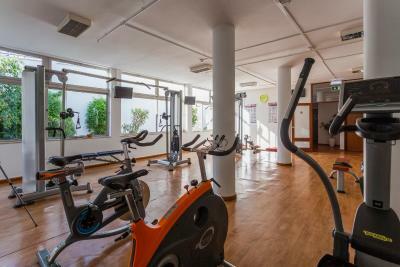 2 min walk to the beach ( including a long flight of steps ) and a 15 - 20 min walk into town means this hotels location is perfect for those wanting to be in touch with but not right in the town. The internet was very weak and slow. 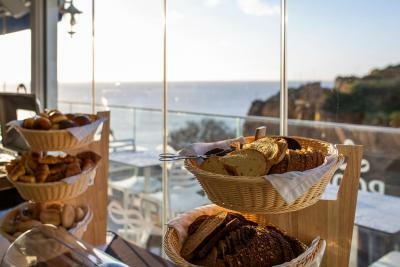 The breakfast was located in the resturant up stairs with a great ocean view. The selection and quality fo food was good. Everything :) best location and true value for money. There’s really nothing I didn’t like about the hotel, the only thing that would’ve been good would be if the pool was heated. 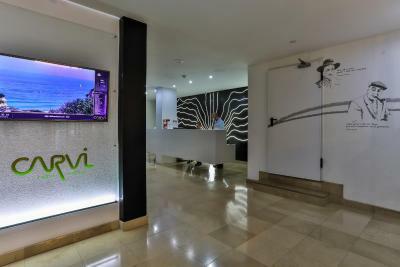 The lady on Reception was very helpful & friendly & let me check in early which was much appreciated. We booked a room with partial sea side view from the balcony. Well, there was absolutely no way to see the ocean if we were to sit on the balcony. I had to stand and band over the balcony to be able to see the water, which was disappointing. 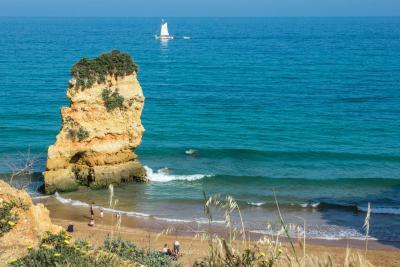 The location of the property was amazing , right at the beach and close to Lagos center. The staff was very friendly. Breakfasts were very good, and the restaurant was great as well. There is no electric kettle for hot water in the room.